Quick Definition: The poverty trap is when the unemployed are financially better off claiming benefits than entering employment. The poverty trap is a term used to describe situations in an economy where people are financially better off being unemployed (due to the benefits and welfare payments) than being in full-time employment. As a result, they have no incentive to get a job and are better off living on benefits. For example, take a low-skilled person in the UK – Keith. Keith is unable to get a high-paid job because he doesn’t have the right skills, training or experience. He has two options: 1. Get a low-paid job (such as in a supermarket) or 2. Claim unemployment benefits. If Keith gets a low paid job he will have to pay taxes and national insurance so he decides he is actually financially better-off just claiming benefits for being unemployed. As time goes by Keith carries on claiming benefits and continues to lose his ability and confidence in himself. This makes it more difficult for him to get a decent-wage job and more appealing to continue living on benefits. Keith is in the poverty trap. Absolute poverty – This is when people’s incomes are so low that they aren’t able to purchase basic necessities such as clothing, food and shelter. 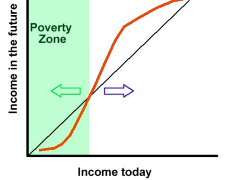 Relative poverty – This is when a person’s income isn’t sufficient enough for them to participate fully into society.